It seemed very fitting that during a week when hundreds of thousands of young people gathered in Panama in a celebration of their faith, that I would also have the exciting opportunity to share the work of JRS UK with groups of young people. 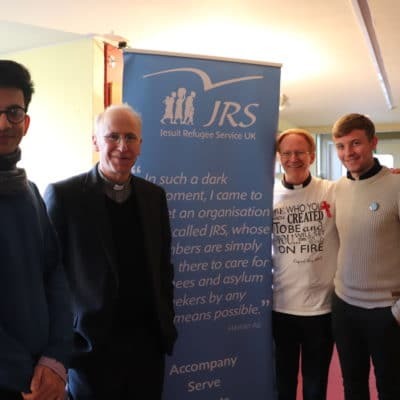 Up first was a trip to Oxford, where I was taking part in a Vacation Projects Fair hosted by the Jesuit-run University Chaplaincy. After each of the day’s masses, students were invited to learn more about a number of different projects that promoted a living faith in the service of others. This was a great opportunity to meet the students and share with them a little bit about our mission to accompany refugees and other forcibly displaced people. It was particularly interesting to talk with people about how we provide support through accompaniment as this not something that many have come across before, and many students were keen to find out the different ways that they could support our friends. Interestingly, some international students had heard of JRS operating in their home countries and were interested in learning about our work in the UK. The enthusiasm with which people engaged was particularly encouraging; though I have a suspicion that might have been something to do with the new JRS bags and badges that I was handing out. A couple of days later I was at St Anne’s High School for Girls in Enfield taking part in a retreat morning for the Year 10 students that was focusing particularly on refugees. 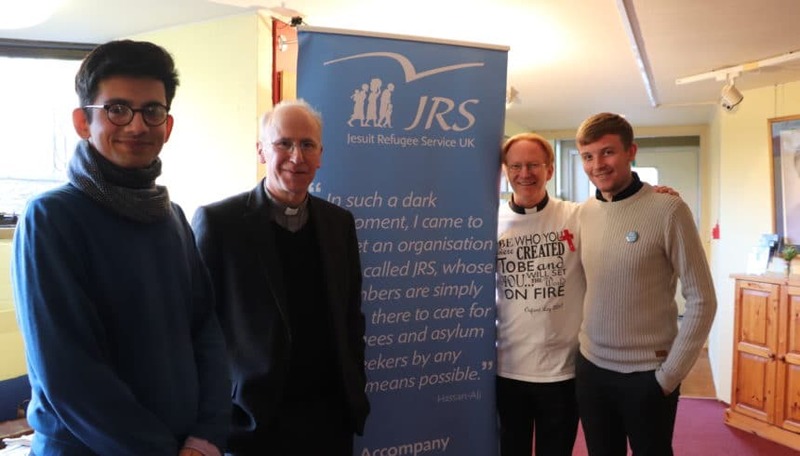 Something that many people don’t really know about the asylum system in the UK is the use of indefinite detention, so I took this opportunity to explain the outreach work JRS does to accompany our friends in detention. Given that the UK’s use of immigration detention can sometimes be quite a surprising discovery, the girls responded in a very mature and insightful way, clearly reflecting deeply on the issues we were discussing. We finished with an activity inviting the students to consider what they would miss most if they had been detained. The responses they gave displayed the empathy and compassion they felt for those who are subjected to the ordeal of indefinite detention in our country. This weekend, Pope Francis celebrated Mass for World Youth Day in Panama, with events having taken place throughout this week. During the Way of the Cross on Friday night, Pope Francis spoke of the need to follow Mary’s example in saying yes to the Lord and through Mary “we learn how to welcome and take in all those abandoned, and forced to leave or lose their land, their roots, their families and their work.” From my experience of past World Youth Days, they are great occasions that allow young Catholics from across the globe to come together and form bonds of friendship with one another, encountering individuals and learning to say yes to new experiences. The benefit of encounter was acknowledged by one bishop taking part in the week’s events, who spoke of the potential World Youth Day has to be an antidote to the prevailing direction that rising nationalism and anti-immigrant feeling are driving public opinion. My recent encounters with young people have shown the capacity they have to see beyond the labels and headlines we are so often presented with, instead looking to the common humanity we share with those forced to flee their homes. May we take inspiration from Pope Francis, from Mary, and importantly from our young people, and become people who say yes to welcome and encounter. Interested in learning more about the work of JRS UK? Would you like JRS UK to give a talk in your school, parish or community? Get in Touch!